A great design for everyone who loves birdwatching. A spoof of highway info signs, 3 icons represent eat (knife & fork), sleep (person on bed), & bird (binoculars). 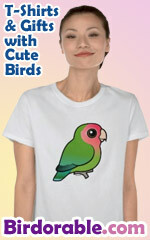 A perfect gift for every birder!